Innistrad Pre Release event today! We welcome Elbert, our resident Magic the Gathering guru and the various players who’ll be attending our DCI sponsored Pre Release event at the Boston store today. Early arrivals can purchase Innistrad boosters and starters. All these materials will be for sale as well starting on the 30th of September when the regular sales event begins as well! Posted in Uncategorized	| Comments Off on Innistrad Pre Release event today! What better way to celebrate your independence than blowing the crap out of an enemy army. Our Warmachine Tournament starts at noon, and has a $10 entry. Minimum twenty five(25) point army. First place finisher gets half(50%) the prize pool in store credit, second place gets thirty percent(30%) and third place gets twenty percent(20%) of the total pool. Toys will also buy pizza for those who come to play. Free RPG Day this Saturday. It will be an active time this weekend as this Saturday, the 18th of June will see us hosting our first Free RPG Day in a few years. Lots of cool stuff, demos and giveaways, as well as refreshments! Activities will be going on all day and will go on past 9pm or later as demand decrees. Come on by, all are welcome! Posted in Uncategorized	| Comments Off on Free RPG Day this Saturday. The New Command Decks will be Here Friday! Just spoke to Elbert, our resident Magic: the Gathering Guru and he’s very excited since Wizards of the Coast will be shipping the new Command Decks in time for an event this Friday! He’ll be here at 5isn and will get folks up for play asap! We’ll have plenty on hand and all are invited. Posted in Uncategorized	| Comments Off on The New Command Decks will be Here Friday! 1st Annual H.P. Lovecraft Birthday Party! August 20th will be 121st anniversary of local author/genre master Howard Phillips Lovecraft and that’s a reason to celebrate. A New England author with a unique and influential vision, his artistic shadow over current culture is vast and, his work is inspiration for a variety of games. Games ranging from Trail of Cthulhu, Call of Cthulhu, nearly every Steve Jackson Games product that isn’t about Otto Skorzeny and a whole lot more. This manager used to run a rather extensive Gaslight Cthulhu game back in the day and it’s high time we pay some credit to HPL. This year, we’ll have demos of HPL related card and board games, we’ll have some readings, some viewing of short subject Lovecraft films, We’ll have refreshments, hopefully a cake and lots of fun. Even if you don’t do much HPL gaming, come by the store and wish the old boy happy birthday! Posted in Uncategorized	| Tagged Cthulhu, Lovecraft, Party	| Comments Off on 1st Annual H.P. Lovecraft Birthday Party! Resident Evil comes to the Store on Sunday! Aside from spawning a heap of video games and filling up Milla Jovovich’s dance card, Resident Evil has also unleashed a card game and you can give it a shot. William Mui will be hosting a demo of the game on this Sunday, May 21st at the store in our backroom and all are invited to attend. You don’t need to bring anything (aside from money to buy if you like it) but come and check it out. We’ve got prize support from Bandai (makers of our popular Naruto game as well) so what have you got to lose but your brains…..
Posted in Uncategorized	| Comments Off on Resident Evil comes to the Store on Sunday! Free RPG Day comes soon! A big hit at our old location, Free RPG Day will once again be celebrated this year at our 957 Comm Ave location ths Saturday June 18th 2011! If you’re new to Roleplaying in general, haven’t strayed far from the D&D reservation or are an enthusiastic supporter of Lucha Libre Champions, GURPS or micro RPG’s like Colonial Gothic or Cold City you should make it a point to come by in and see what scenarios and giveaways we’ll have to share. Haldan Smith, our ever popular D&D Encounters guru will be running scenarios from a variety of companies and he really knows how to have fun with player character group! See you there! Posted in Uncategorized	| Tagged Free RPG Day	| Comments Off on Free RPG Day comes soon! On Saturday the 21st, while folks around the country were waiting for the world to end, Kevin, William, Frank and a variety of customers watched how the world ended for the Wehrmacht in a vigorous Axis & Allies Mini Rules Demo in the back room. It went quite well with Kevin and the folks who attended. A scenario involving King Tiger tanks up against Allies in forested areas was fought to a vigorous conclusion. Both players and observing customers had a good time enjoying the refreshments as well as the game. If you’re interested in having a go yourself, keep checking us here or on Facebook. See you there! Posted in Uncategorized	| Tagged Axix & Allies, Demos	| Comments Off on Another day, another Demo! 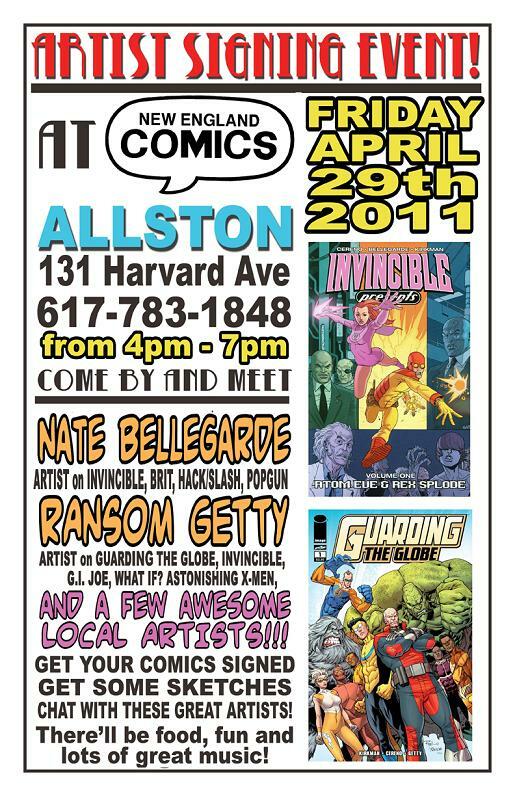 Comic artists Nate Bellegarde and Ransom Getty will be at an artist signing event at New England Comics in Allston from 4pm to 7pm Friday, April 29th! Come meet these great artists as well as great local artists such as Tofusquirrel and musician Casey Desmond! Today will be a lively day with morning Boardgames takes place as Matthew Epstein comes by to do a demo of When Lions Sailed, an age of sail mini game from Strategy and Tactics magazine. Later William Mui is running our usual Heroclix event. 500 Point golden Age.